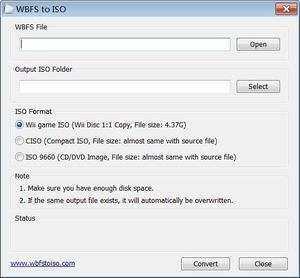 WBFS to ISO is a very simple tool to help with backing up and restoring WBFS images for the Nintendo Wii system. It can copy the contents of files up to 4.37GB. Using WBFS to ISO isn't a complicated task and involves selecting a WBFS file from your hard drive (or other location) and choosing an output destination. For security reasons, you should also check out the WBFS to ISO download at LO4D.com which includes virus and malware tests. Additional screenshots of this application download may be available, too.